How ‘low-vision friendly’ are our public spaces? Public spaces may be planned and organised or completely informal, but the visually impaired person will need to orientate themselves and learn how to navigate through them safely and with confidence (see tips on helping yourself). There are, however, principles that planners and architects can take into consideration when building a user-friendly environment. These principles will increase safety, not only for the visually impaired, but also the elderly and those wearing multi-focal glasses and for young children. Most visually impaired people do not drive (although some do and should not!) and so, by default, become pedestrians. For some this poses new problems that they had not encountered before. The safety of walkways, road crossings and stairwells become an important factor in one’s independence. I’ll look at some common problems and solutions in the built environment. Stairs are potentially a very dangerous place in a building – if you fall it could be a serious accident – so it is important to make them as safe as possible. In many of the modern shopping malls there are tiled floors with various colour changes to make it look classy, but this can often create havoc for sight impaired people because changes in colour can often be perceived as changes in height or depth. Below are some photos of well contrasted stairs and some very confusing stairs. You can decide which ones you feel safest on. The natural lighting, which changes according to the time of day and season, also plays a part in the visibility of the stairs. Shadows can be useful for spotting the edge of a step, but in full sunlight this same step can be very difficult to negotiate. For this reason it is helpful to have contrasting tiles, bricks or shiny strips on the edge of the step. 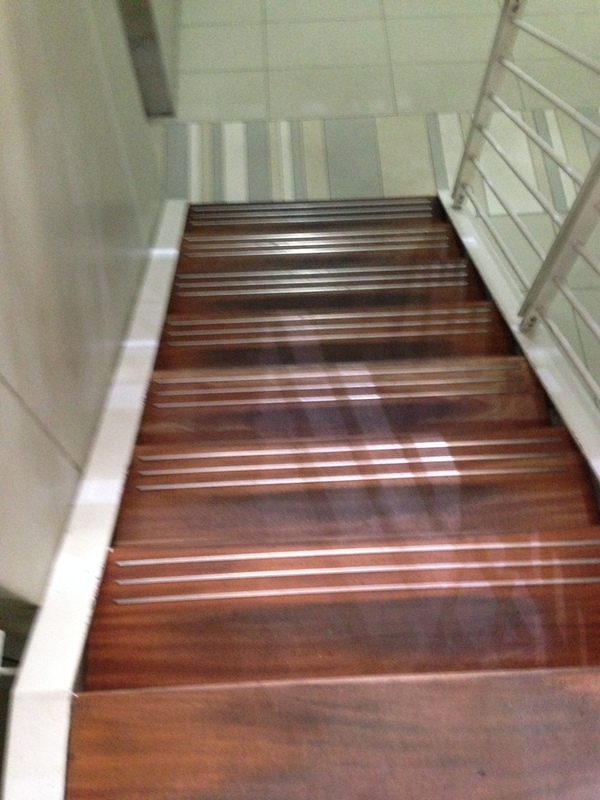 White or yellow stripes on the edge of the stairs are useful even though not very attractive. A black stripe or tile is NOT helpful as it looks like a gap and so is confusing in identifying the edge. I personally like the silver strips on the edge as it reflects the light both on the way up the stairs and also on the way down. Many advertisers would agree that signs are better in visual depiction than in written word. I find it funny how many people falter at a door that says PUSH or PULL – even though they can see the words. The picture of a flat hand pushing or a gripped hand on a handle would take less brain processing! And this goes for public toilets too. The size and contrast and position of the sign can determine how easy it is to see. I have found myself standing on tippy toes with my face as close to the sign as possible trying to see which loo is for me, or praying for a distinctive male or female to emerge from the bathroom. Luckily, if I am desperate, with my sunglasses and white cane, I can walk into either one and not be embarrassed it can, however be embarrassing for others) A clear picture eye level (not hanging up near the ceiling) is low vision friendly and child friendly. Our local shopping centre has very tasteful and visible signs on the door. There are glass doors leading into our local gym. They are very smart and give an open feel to the place, but the fact that the panels next to the doors are also glass, leaves me guessing where to enter. In the beginning they had a large black mat in front of the doors which was as wide as the doors. Now I just smile and walk in the direction of the door and rely on my white cane to get me through ….. or I follow another person …… presuming they can see. A plus for the gym, in my opinion, is that the length of the indoor pool is exactly the length of the nearby windows. The end of the pool can be easily judged by the contrasting light, or dark, of the sky. I think this may be confusing for other members who see me arrive with a white cane and then I ask which lane is free and then I tumble-turn at the end of the pool as if I can see it clearly. I am not sure if there is a rule about putting signposts in the middle of a walkway. The grey, galvanised poles and the grey tar are a great combination for camouflage and an open invitation to the noses of VIP’s(visually impaired person). Note: to walk into the same pole twice is just the sign of an impaired memory. As mentioned before, it is our responsibility as vision impaired people to make sure that we are safe on the move. It is helpful in older environments and unplanned spaces to familiarise oneself by asking a sighted person to show and describe the area to you. With regards to new and renovated public spaces, I would like to appeal to planners, engineers and decorators to consider low vision sufferers when creating user friendly spaces.